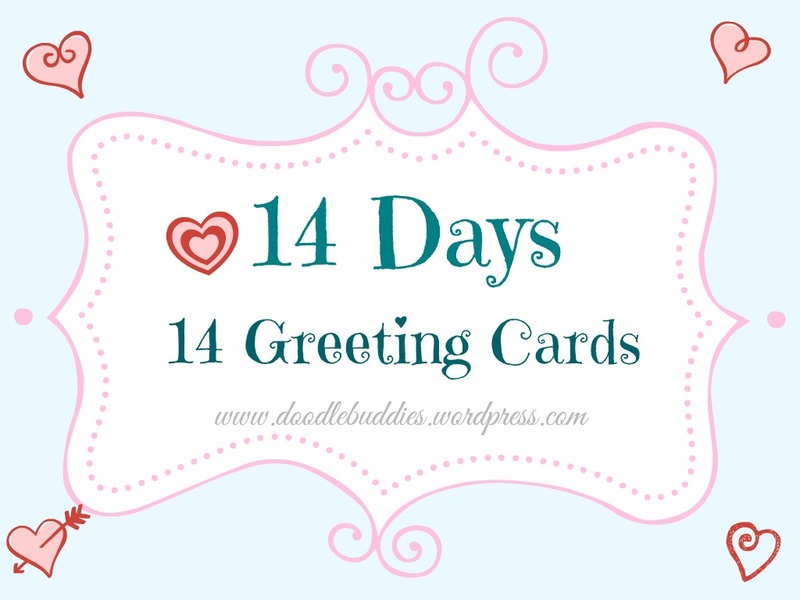 Finally, today is the 14 days – 14 cards’ final card !! Yippee !! 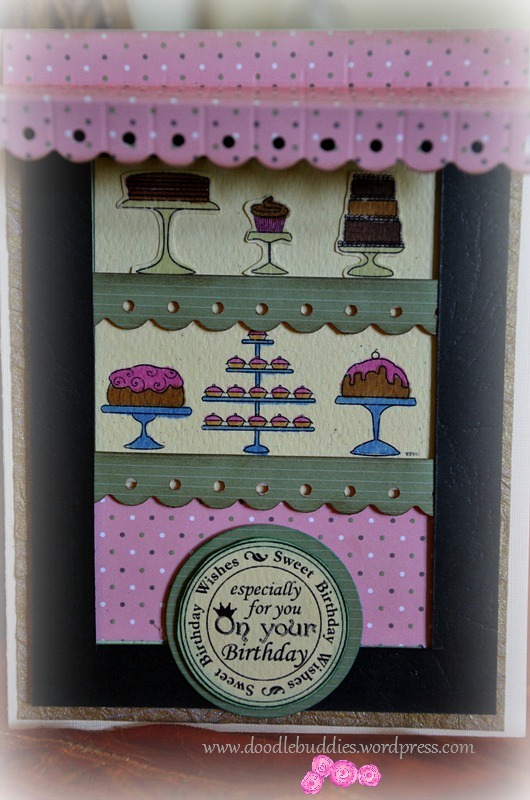 Awning, Diecut circles, digital stamps (sentiment and cakes), polka dot design paper, MS border punch, various design papers. 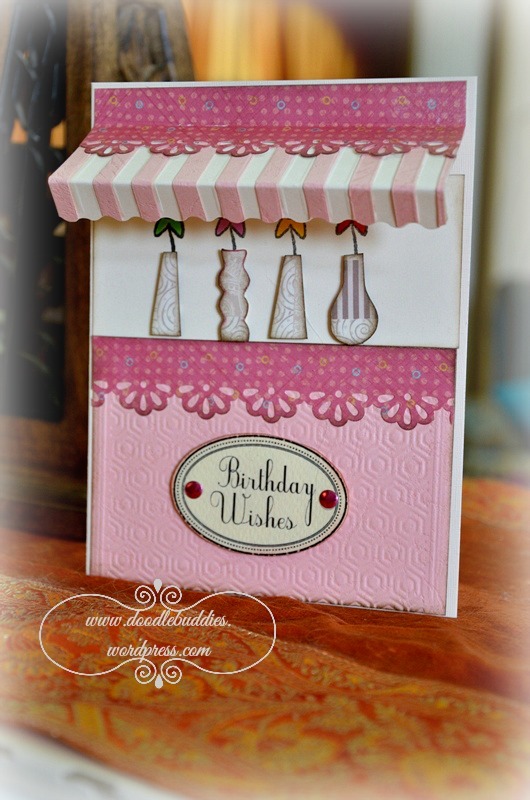 If you’ve been following my blog, then you already know that I have been having so much fun designing these awning cards. The possibilities with these cards are endless. You can have a store window display of ANYTHING from a library to a bakery and everything in between !! Today my card is another Awning card, with a store window display of some purses. 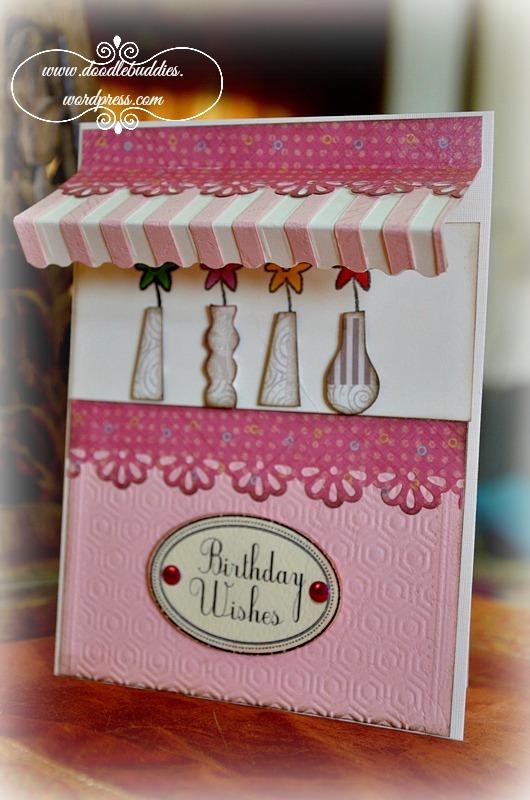 Hope you like this card and appreciate it as much as the previous awning cards too. 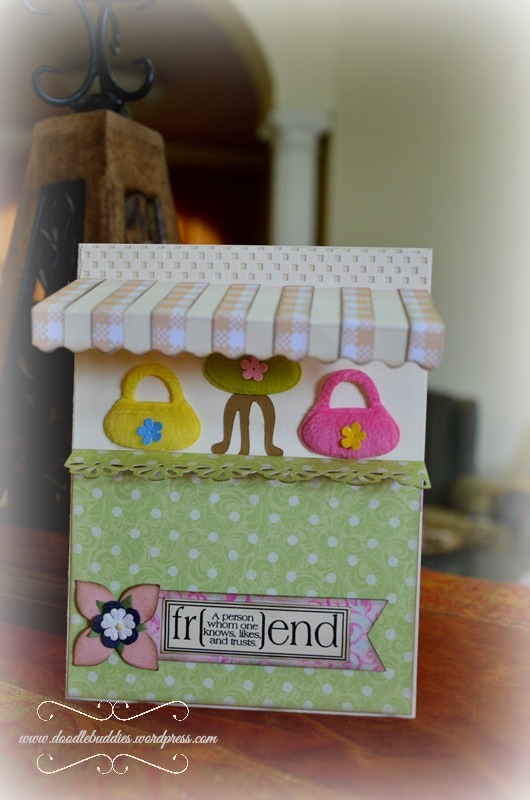 Stamp and Create – M, 1E/week – (March) Is it Spring yet? Okey dokey !! and that’s That !! Have you ever walked past, a cupcake/pastry store ? Well here, I have ‘tried’ to recreate the look of a store display with some cupcakes and an awning. Trust you will like it. 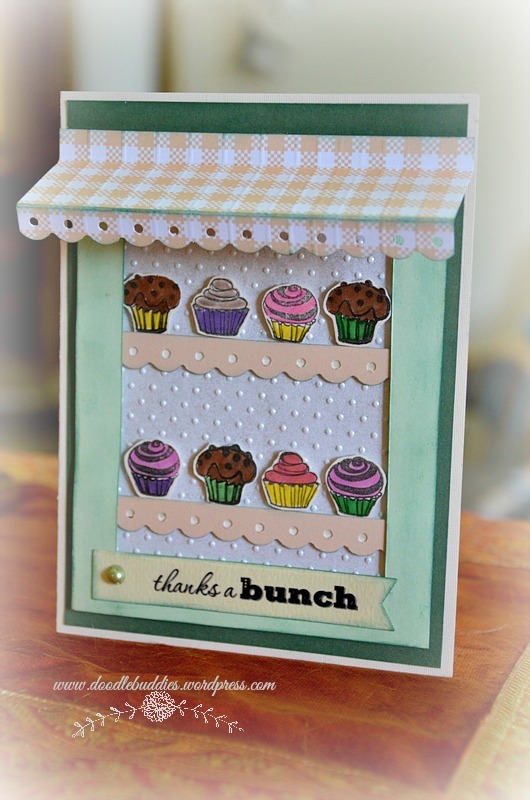 This Thank you card, has several things going for it, including, bling, border punch, dry embossing, copic markers, nesstablilities diecut, a tag and the awning. 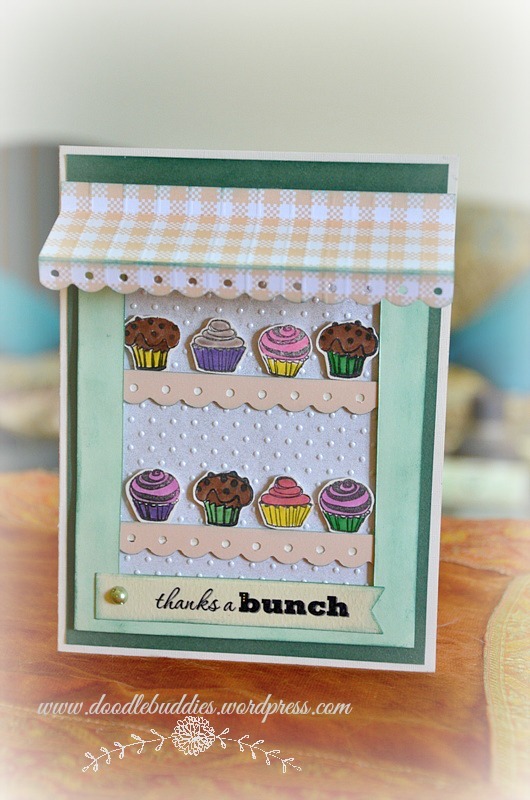 The sentiment is digital stamp while the cupcakes are rubber stamped. There are two design papers, the pearl white one is embossed but its shine does not radiate in the photos 😦 The awning card does take a bit longer to work around becoz without the appropriate measurements, the awning itself, can ruin the card. But if it fits well, its a fab. Hello friends ! I am continuing the 14 days 14 cards series. This being my 10th card. This is an awning card for a boutique/window display. Elements/techniques in this card include :- Dry embossing, rubber stamping: flowers, border punches, design paper, pink brads, die cut oval, sentiment: digital stamp. Each one of those vases are paper pieced individually and distressed, copic markers on flowers. The awning itself, was a lot of effort. Had to cut stripes of pink and add to the white portion to give it an awning-like appearance. Plenty of layers involved here. Perhaps, becoz I tried this technique for the first time, I took a long time to design and dress it up. I just love how it turned out ! Well, that’s it then !! Muslims follow the lunar calender and fast in the holy month of Ramadhan. The month could last for 29 or 30 days depending on the siting of the moon. When the new moon is seen, the following day is celebrated as Eid, which is the celebration for having been blessed with the holiest of all months, Ramadhan. As in all cultures and traditions, lots of sweet dishes are prepared and its a totally family oriented affair. Here in the middle east, exchanging of sweets amongst friends and collegues is practised, however for those over seas, cards are sent. 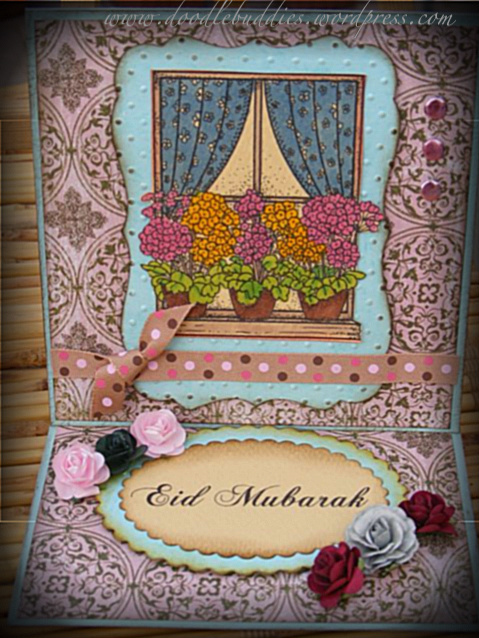 This year, I was requested to design 3 Eid cards by Noor the coordinator for paperie designs which they wished to feature in their blog. Here is the first card that I made. It is an easel card and I am completely in love with the DP. It has the gorgeous vintage touch to it. And dont we already know, how crazy I am, about any shades of pink. The window is a digistamp and so is the oval sentiment. Plenty of diecuts used here. Well folks, thats it for now. Thank you for visiting me. I hope you return again. Till then, stay safe and keep being creative. This here is my first attempt at the easel card ! Yeah, can you believe it ?? 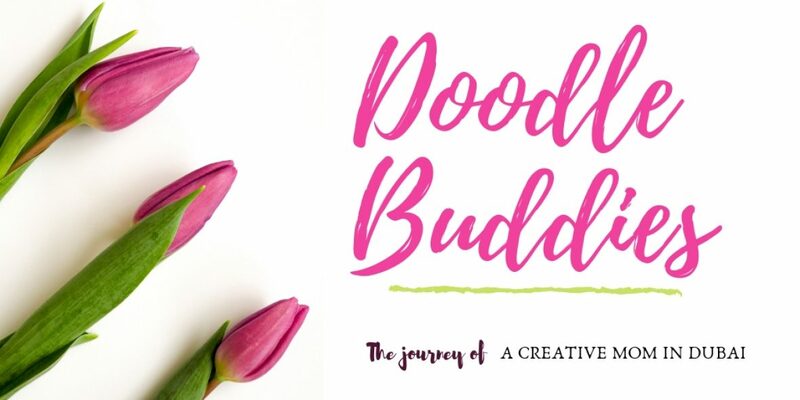 Well, since my mojo is on a real high, I wanted to experiment alittle beyond my range and frankly, as most crafters, we only realize our boundaries are limitless when we try to push it a little further .. we can stretch it with motivation and thats exactly what I am, right now ~ Motivated ! Making this card was not only fun, but I realized something strange. Being someone who feels more comfortable with symmetry, square cards provide alot of channels for me. I felt more easy with dividing in halfs and finding center focals ! My general style of card layouts are rectangular landscapes. So, yeah, I think you really will be seeing more of these here on ! Like I mentioned in my previous post, I rediscovered the corner punches (and perhaps got carried away a wee bit !!) Ofcourse I havent used any embellishments becoz, I wanted the paper colors, punches and the stamp, which is a digital stamp, to be the focal point. The card is supported by an oval sentiment in the inside of the it. I am pleased with the outcome and I feel, I have done a good job. And now, its your verdict time guys ! 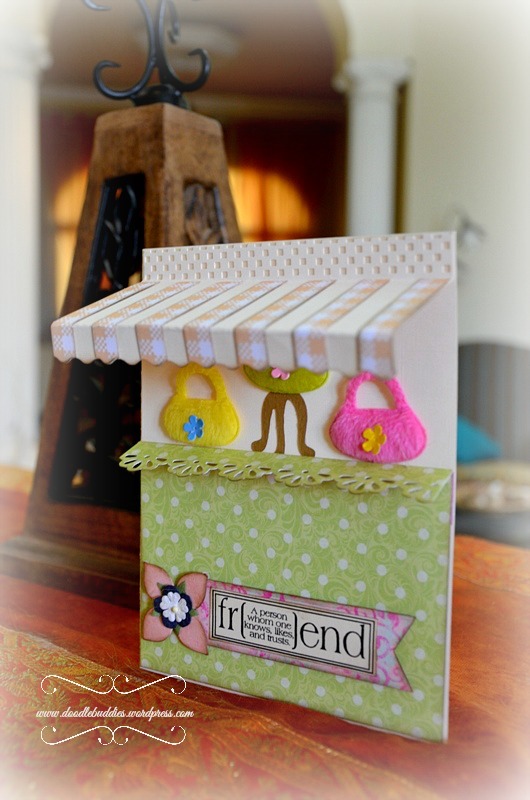 The Crafty Pad – something new ~ Digi is new for me & first attempt at making an easel card !! 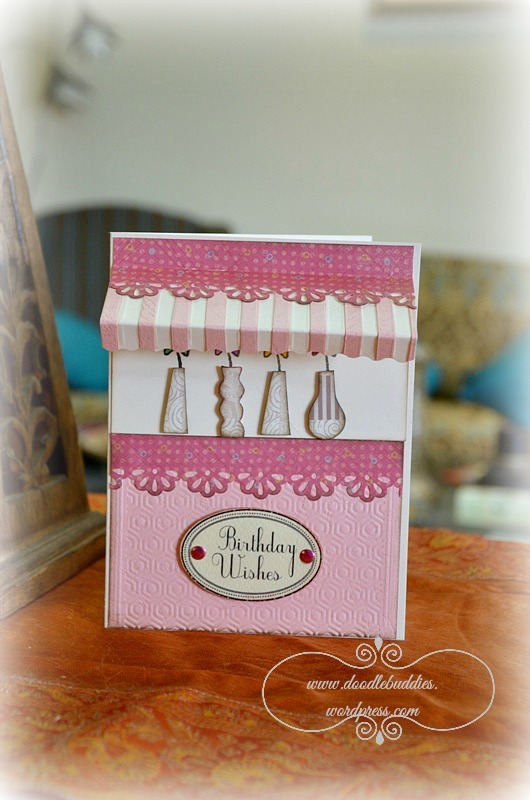 Sassy Studio Design – Something old ~ I used corner punches after ages !!! 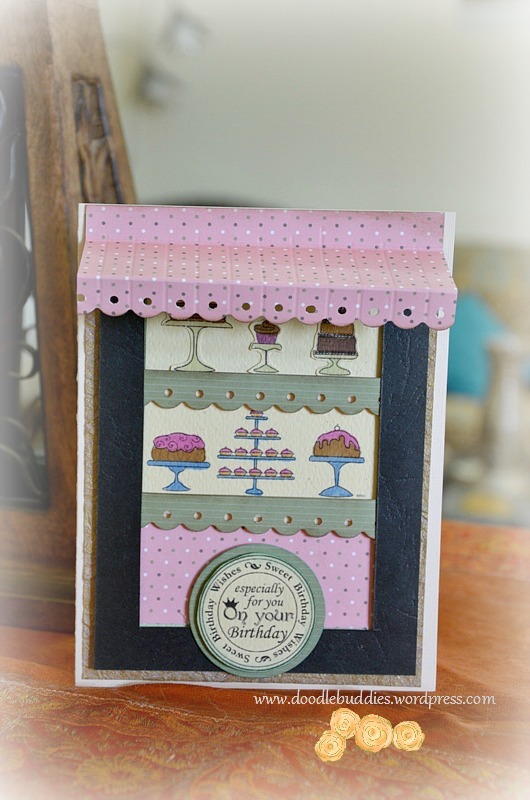 Pollycraft – New Things ~ Digi is new for me & first attempt at making an easel card !! 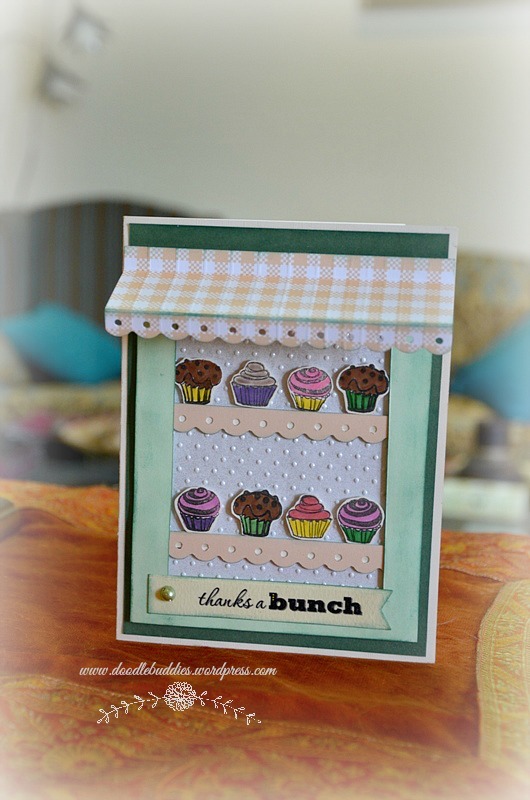 Creative Cottage – Something New ~ Digi is new for me & first attempt at making an easel card !! 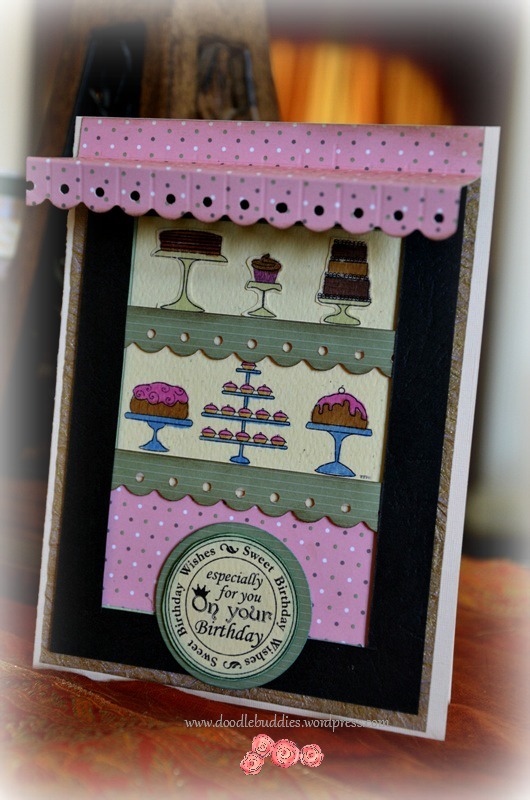 My Partner in Crafting Crime – Something New ~ Digi is new for me & first attempt at making an easel card !! 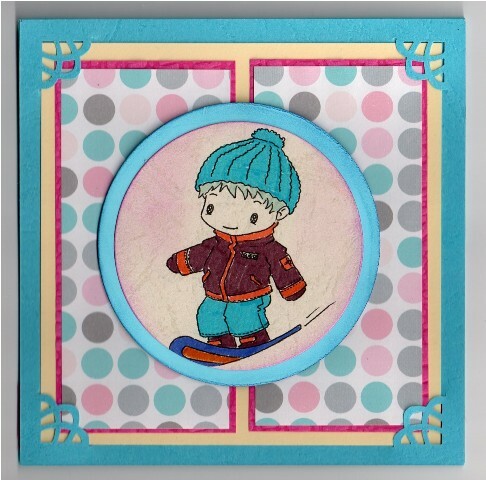 Crafty Purple Frog – New Things~ Digi is new for me & first attempt at making an easel card ! !.